Lounging with a Latte: This one is for Lyn! 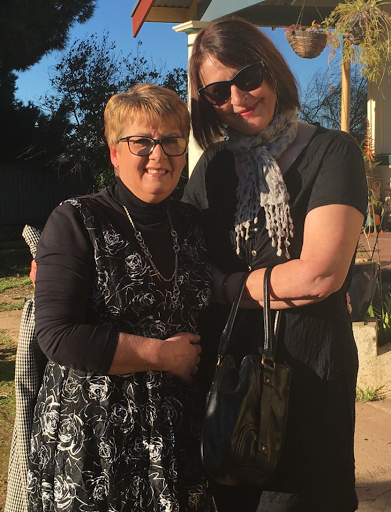 Yesterday we attended one of my nephews wedding and caught up with one of my sisters friend Lyn who I hadn't seen in years. As we started chatting Lyn advised me that I hadn't done a post in quite a while! It was really funny, Lyn isn't a blogger but follows my blog and many of my fellow bloggers and I had no idea! So you prompted me Lyn to get my act together and do a post!! Here is Lyn (on the right) with one of my sisters Joy. 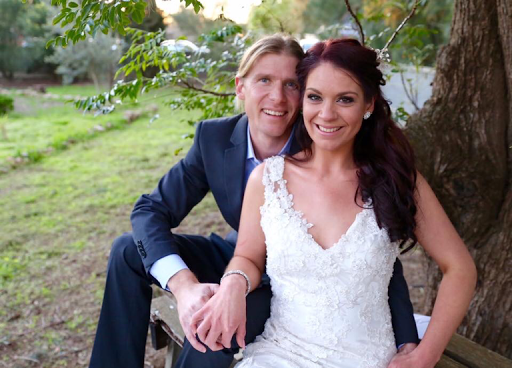 It was one of Joy's sons that got married....it was a lovely day. 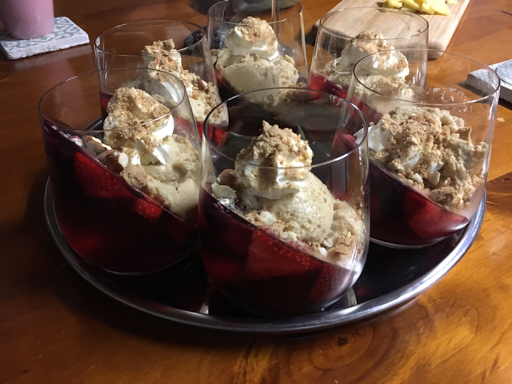 A few weeks back we had friends over for dinner so I decided to make a dessert that I had seen on Pinterest. It was super easy to make but looks quite fancy! Here is the finished product (not real good photo!) See the diagonal jelly. 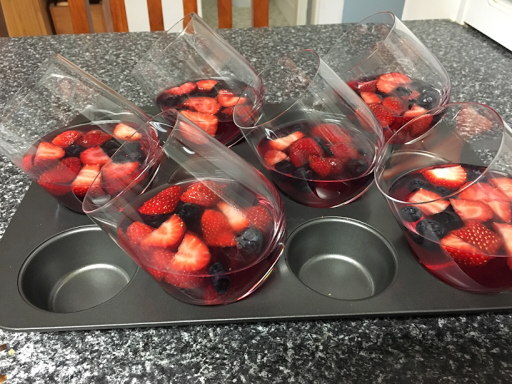 I made raspberry jelly and poured it into the glasses over some cut up strawberries and blueberries. You then place the glasses at an angle into a muffin tin and wait til it sets. You can then top it with whatever you like. I made coffee mouse and topped that with sliced bananas and crushed almonds and whipped cream.....it was very yummy. 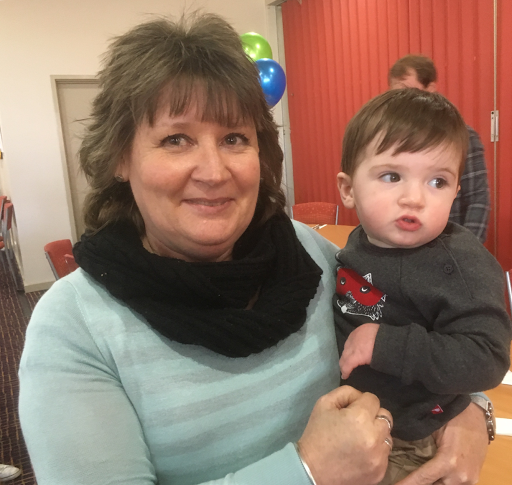 I share my birthday with our 2nd grandchild, Luca, and we celebrated his first birthday a couple of weeks back with a family lunch at our local Club. 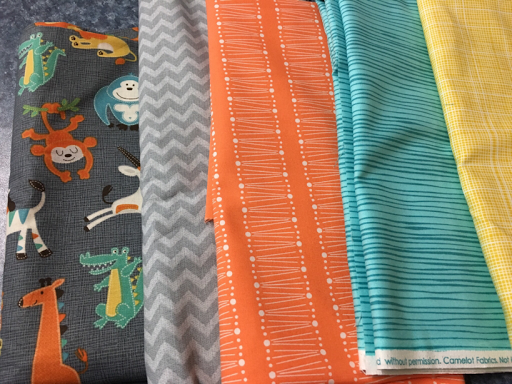 We have our third grandchild on the way very soon, so I have started a little something with these fabrics...will show you the finished piece once the baby has arrived.